On Monday, April 27th, the official White House china service of President Barack Obama was introduced to the public at a press conference held by The White House curator, Mr. Bill Allman. 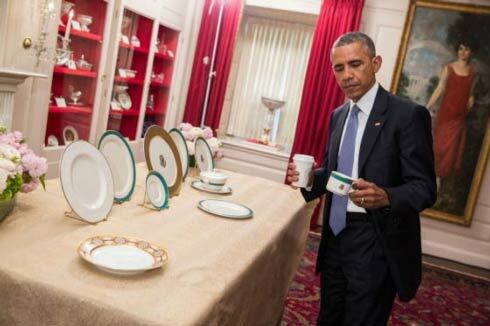 The Obama Presidential china service was proudly produced by Pickard China. Several of the pieces within the Obama Presidential china service feature a stunning blue-green color on their decorative rim. The White House noted that First Lady Michelle Obama selected this color because it reminded her of the ocean waters off the President's home state of Hawaii. White House curator Bill Allman noted that the china service's beautiful and striking blue-green color has been dubbed Kailua Blue in recognition of Mrs. Obama's inspiration. During a recent interview, Pickard president Andrew Pickard Morgan noted, "It was an incredible honor to be selected as the manufacturing resource for the Obama White House china service. Every piece of Pickard china is made with great skill and pride, but producing china for the White House was certainly something that was very special for everyone working at the company." 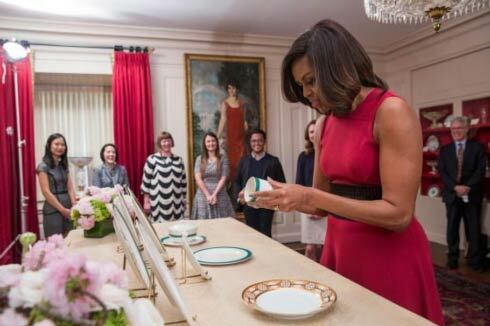 Morgan went on to say, "Two of the items in the Obama White House china service, the dinner plate and individual soup tureen, are unique bas-relief shapes that had to be designed from scratch for this project. It took us more than a year and countless trial pieces to get the individual tureen bowl completed. It was really incredible to see the group of my employees tasked with developing this item coming in early to work because they just couldn't wait to see the latest trial piece coming off one of our kilns. 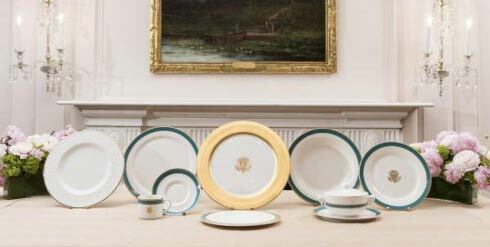 When asked if Pickard had ever produced any Presidential items in the past, Morgan noted, "Pickard produced an official White House china service for President George Walker Bush and First Lady Laura Bush in 2008. This china service was a co-branded effort with the Anna Weatherly line and is known as The White House Magnolia china service in honor of the beautiful magnolia flower on the charger plate. Pickard has also produced official protocol gifts of state for many U.S. Presidents dating back to FDR. In addition to this, Pickard was also very honored to have manufactured Presidential china services for Camp David, Air Force One and Blair House. Pickard China was founded in 1893 by Wilder Austin Pickard and to this day remains a small family-owned business dedicated to producing the finest china in the world. Additional information on Pickard China can be found on the company's website at www.pickardchina.com.